SIKESTON, Mo. (AP) — George Morris recently bought a 41-foot motoryacht, but he’s not planning on cruising the Pacific or the Atlantic. He’s keeping it on a small pond near his Southeast Missouri home. The Sikeston Standard Democrat reported that Morris saw the movie “Secondhand Lions” and decided to re-create a portion of the film, in which one of the characters floats a yacht in a pond. Through a series of contacts, Morris was able to find a 1965 luxury double-cabin Hatteras motoryacht in Talladega, Ala. Getting it back to Missouri wasn’t easy, because the boat was too big to fit under interstate highway overpasses. So, he first had to remove the flybridge and bring it separately. He returned for the rest of the boat — and he brought back an 18-foot palm tree he acquired in Florida, for good measure. On the way home, the weight of the boat proved to be too much for the trailers that were pulling it. Morris said the boat destroyed four during the trip. “The trailers would fold up like a shoe box and smash,” he said. That left Morris, a self-described “old bachelor,” temporarily stranded. For a while, he had to camp aboard the yacht at a gas station in Pell City, Ala., until help could arrive. That stirred curiosity in town, and television news crews did stories on the stranded yacht. The yacht is drawing plenty of attention now that it’s in Sikeston, too. Morris proudly shows off the boat, appropriately named after the movie from which Morris drew inspiration. A contractor has completed digging a pond on land Morris owns just off Interstate 55 near the former Sikeston Drag Strip. 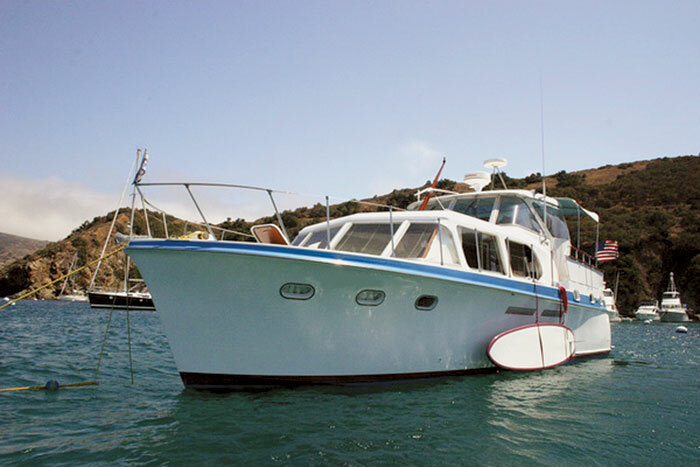 The yacht is trimmed in mahogany and has two staterooms and two heads. Morris said he plans to rent it out for honeymooners. ← U.K.’s Visa Regs Lead China Yacht Buyers to U.S.